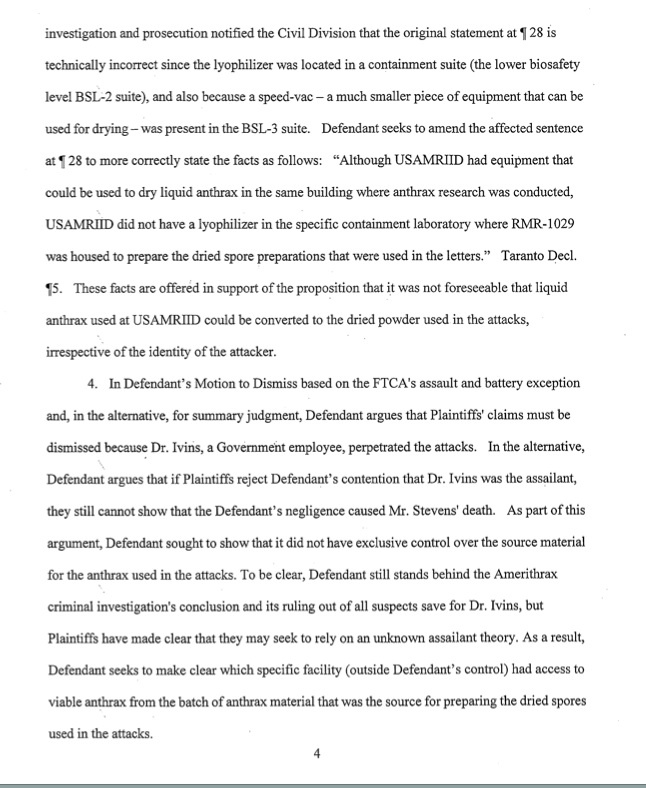 * AMENDED MOTION TO DISMISS filed 7/27 now suggests Dr. Ivins used SpeedVac and notes that anthrax sent to Covance was “likely” irradiated « CASE CLOSED … what really happened in the 2001 anthrax attacks? This entry was posted on July 28, 2011 at 11:42 am	and is filed under Uncategorized. Tagged: *** 2001 anthrax attacks, *** Amerithrax, *** Dr. Bruce Ivins, *** FBI anthrax investigation, AMENDED MOTION TO DISMISS filed 7/27, Covance, SpeedVac, Stevens v. United States. You can follow any responses to this entry through the RSS 2.0 feed. You can skip to the end and leave a response. Pinging is currently not allowed. The judge granted the requested leave to amend. 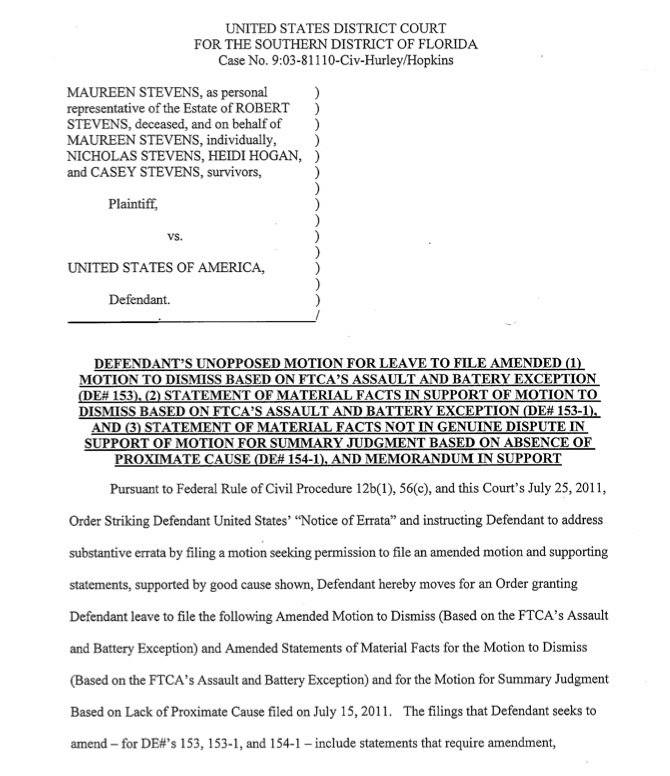 The DOJ today also filed motions to amend the remaining motions. The problem isn’t so much the Ivins-did-it hypothesis is untenable, it’s that the Ivins-did-it-alone hypothesis is untenable. And you’ll notice there really was no justification for THAT conclusion. But the sub-rosa justification was along the lines of: ‘Look, if we admit that Ivins even MAY HAVE had an accomplice or two, then the public, the media, and the Congressional oversight will go ballistic if we try to close the case: Pat Leahy in particular will demand that the case be reopened with an eye toward identifying those accomplices.’ So Ivins had to be posited as ‘acting alone’. 1) why Ivins’ block printing is such a mismatch for the printing of the Amerithrax letters. 2) why no one saw Ivins drying any anthrax in 2001 at USAMRIID. 3) why there’s no indication Ivins was in the state of New Jersey in September and October of 2001. 4) why there was so much unevenness in the purity of the first and second batches of anthrax. There is no evidence indicating that Dr. Ivins was involved at all. Indeed, the entire theory as to motivation is uniquely and exclusively related to him. The imagined circumstantial evidence consisted of items such as the code based on a letter that was not in fact underlined. In theory, it would be possible to produce the attack material without a fermentor, large centrifuge, and lyophilizer. However, such alternative methods would require prior knowledge and experience, as well as more time and more space. So where is that time and space? Certainly not at Fort Detrick. Ivins would have needed EXCLUSIVE access (so no one would notice) and considerable uninterrupted time (days on end, not just overnight processes) to accomplish this. I would find the FBI’s “prosecutorial narrative” much more convincing if they could have produced evidence (or even suggested) that Ivins had access to private, clandestine workspace. They have never, of course, postulated such a thing. Soon after Ivins committed suicide, the FBI makes statements regarding what an expert Ivins was in producing highly purified anthrax (it was his “signature”). But the attack material wasn’t even produced using Ivin’s “signature” method (Renagraph for purification). So how was it accomplished? Any alternative method would have had to be developed and perfected first, then employed. Not something one can do over the course of several evenings. And the FBI at this point certainly knows if the material was produced on plates or in liquid. Material produced on plates might better fit the Ivins theory (he grew them over a period of weeks in the trunk of his car? ), although, once again, such a process would be incredibly time consuming. Yet no word from the FBI regarding their determination of material from plates vs liquid. BTW: Most of the discareded plates from the animal challenges would have been direct count plates, needed to establish the CFUs/ml of the infective dose (and therefore the LD50). They would have been inoculated with diluted material so the resulting colonies could be counted. In otherwords, I would expect very few would actually be covered with a solid lawn of growth, and therefore contain little actual spore material. “I know that we are close. I know we are on right path. I firmly believe we’ll recover them. I think you’ll be in Boston reporting that news,” Amore said. I came across some content from a sealed motion by David Turner for a new trial. It was written in hand by a co-defendant on the back of another filing and thus comes to light by accident. It is being mailed to me and so I don’t know the content yet — but I agree with those who suggested David Turner was one of the robbers and just doesn’t know where the paintings are. The paintings were stolen 20 years ago — and it illustrates that perhaps truth can emerge even two decades after the crime. When highly esteemed experts like Patricia Worsham says there was not the equipment available, she would have been referring also to the Speed Vac discussed in this patent from 2000. Bruce Ivins et al applied for a patent in 2000 which was granted in 2002. This patent, of which the District Court can take judicial notice, describes use of the speed-vac. This patent was applied for in 2000. Ivins knew from this data that it would be impossible for him to produce the anthrax at his lab and convert it into high quality powder in the amounts in the Senate letters. The speed-vac could not process this volume. Ivins knew that. Dr. Worsham apparentlly knows that. He is the principal person on the patent and is listed first out of alphabetical order. The patent also cites Ivins own papers. Does Dr. Worsham, who served as a key FBI expert in connection with genetics, address this somewhere in her deposition? 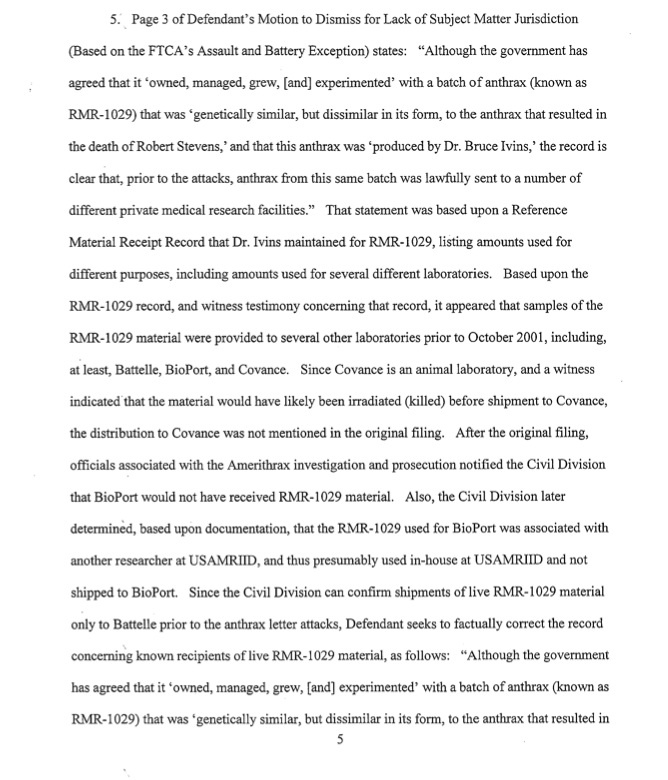 The latest government filing in the Stevens case (above) now says “it was not foreseeable that liquid anthrax used at USAMRIID could be converted to dried powder used in the attacks.” Not only was it not “foreseeable,” it was apparently not possible. Who did have both the equipment to make powdered anthrax and the RMR-1029 anthrax to make it from? That can’t be a very long list. So why hasn’t the FBI offered a plausible culprit based on actual evidence, after the most expensive investigation in its history? Also, what’s with the calcium carbonate crystals? O.K., but if that’s the case, where is the calcium phosphate??????? Why, if it was Ivins? Makes sense, if one didn’t have access to a centrifuge that could spin down multiple liters of raw material. What does “suggests” mean? Does the DOJ/FBI actually know what equipment was available to Dr. Ivins on the relevant nights when they say he made the powdered anthrax? Are there not logs which would show who was using the equipment at those times? It’s getting very hard to follow the government Ivins theory de jour. The investigators quite candidly have told the wired reporter Noah that they do not know the when, how or why of the crime. Reading that filing gave me a headache. Turning to the issue of the Speed Vac, Dr. Gerard Andrews mocks the suggestion. Even Ed Lake agrees that a Speed Vac probably was not used by Dr. Ivins. So once again the government puts forward a “grasping at straws” theory that makes no sense whatever. As I have said before, why should we believe anything the FBI/DOJ have to say about this case? They can’t possibly be this incompetent, so what are the other alternatives? All these filings are leading to a sea of confusion – which is probably what the DOJ wants to create. 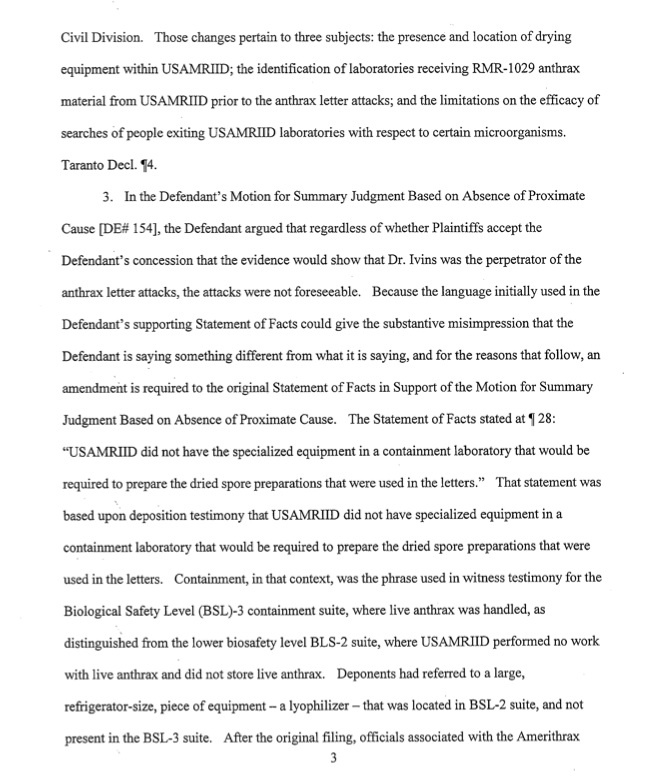 I think the Covance and Bioport items are not important – both of these likely refer to aliquots of RMR-1029 used inside USAMRIID for Covance and Bioport projects. I don’t see why Bioport would find dead spores of much use for anything – they are a vaccine company. At least the DOJ are now saying the fordidden word “Battelle” out loud. But they seem to have forgotten that live RMR-1029 spores were also sent to Dugway and the University of New Mexico. The speed vac is yet another load of BS – impossible to make dried spores with that. The Speed Vac has been discussed in connection with lyophilizaton, now, for two years. Didn’t it come up in deposition? If so, what did the deponents say? Comment: Someone should take that model Speed Vac and see if it fits under that model hood. Melanie Ulrich, who worked with Ivins, has said that it wouldn’t fit. Where is the evidence in the record (or otherwise) that it would? How long would it take? This is simple matter to duplicate and yet there is nothing in the record bearing on the issue that would support the DOJ’s position, is there? The current chief of Bacteriology has said that there was the equipment at the lab that would have served. She was a key FBI expert. When she says there was not the equipment that would have served, who are the DOJ lawyers to say otherwise? What record evidence are they relying upon? It seems that someone wants to identify the precise model that was in the lab and then call the company’s technical representative. For example, this Savant tech rep provides his number if anyone has any questions.